From points North: Take 250 south through Fairport, turn left onto Pittsford Palmyra Road and be prepared to make a right hand turn 50 yards after you see Panera Bread on to Chardonney Drive. We are the building on your left. 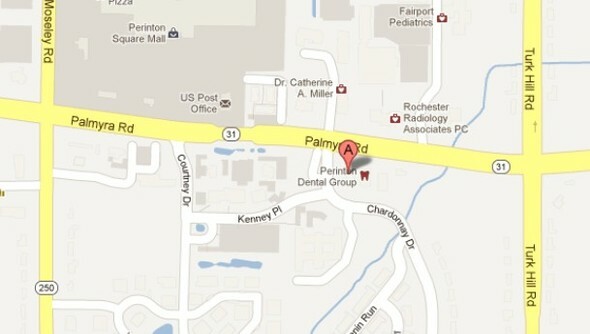 From points South: From Eastview Mall, take Turk Hill Road north and turn left on to Pittsford Palmyra Road. Make the first left onto Chardonney Drive and our office will be on your left. From points East: Take Route 31 east and make the 1st left hand turn after crossing Turk Hill Road on to Chardonney Drive and our office will be on your left. From points West (or from 490): Take the Route 31 / Pittsford-Palmyra Road Exit east towards Fairport. Go past Wegman’s and Tops and be prepared to take a right hand 50 yards after Panera Bread onto Chardonney Drive. Our office will be the first building on the left.